The samurai roll out. The cavalry takes up an ambush position off to one flank. Archers trade volleys. My second, reinforcing army speeds towards the fray. 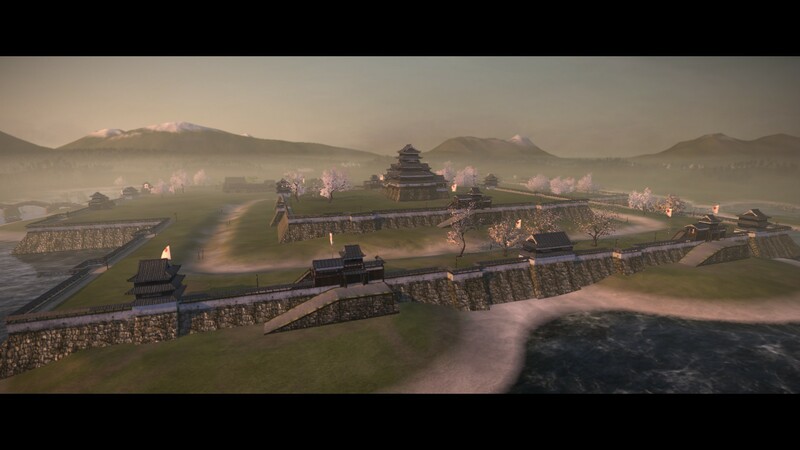 … and then Shogun 2 crashes. Irritated, I reload the game and autoresolve my way to victory. With the Hatekayama armies destroyed, all that’s left is mopping up. I delegate this to Nobushige, who spends the rest of the game pacifying the east. Shingen and his army hurry back west. To win the game, I need to seize several provinces to my west. Kyoto, held by the incumbent Shogun, is one. The other two are South Shinano (held by my Imagawa allies) and Hida (held by the Jinbo). The Imagawa have stuck with me throughout the entire game… and in the end, I’ll have to repay them with steel1. I feel a bit bad about this, so instead, I hedge. While I invade the Jinbo lands as planned, I initially refrain from declaring war on Imagawa. Instead, I incite a rebellion in South Shinano. The rebels seize the province… and just as quickly, my army snatches it away again. Naturally, the Imagawa aren’t pleased. Yet peace prevails between us — until the Imagawa attack the Otomo, prompting the Otomo to ask for my aid. A valid reason to declare war! I side with the Otomo. With a clear conscience, my armies roll into the Imagawa lands. The lightly armoured archers of my first wave soon fall back under the defenders’ own archery. I send in the second wave: heavily armoured samurai. My men scale the walls, burn open the gates, and crash into the defenders. Behind them comes my third wave: the Takeda cavalry. In the end, the victory is hard-won — and a victory all the same. I bask. And then the game crashes again. … I never did get to use my shiny new muskets. 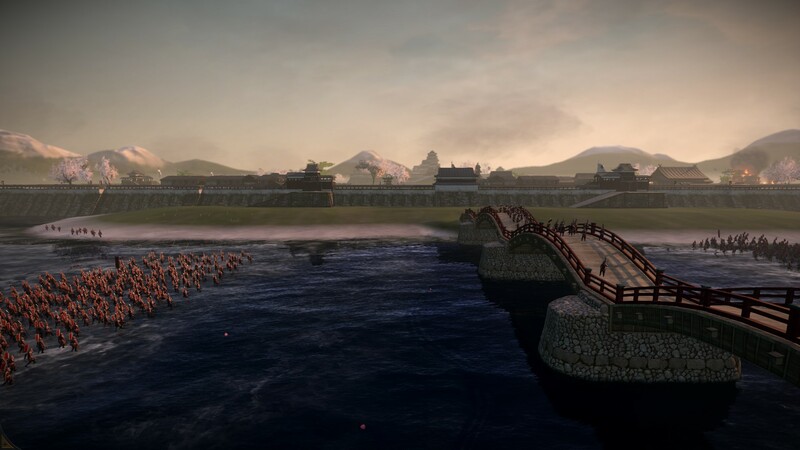 Shogun 2 is the rare game that crosses the line from good to great. I’ve already praised its aesthetic. It boasts a remarkably tight and elegant design, with limited micromanagement (especially compared to Total War peers). It’s polished — those crash bugs in the last instalment were the nasty exception. It rewards a good plan, and it definitely punishes a bad one! As such, my strategy was driven by the lessons from a previous, unsuccessful run. That time, I made two mistakes: I didn’t invest enough in my economy at the start, and I expanded too far and too fast, pushing my borders beyond what I could defend. The result was that AI players mobbed me from every direction, and I couldn’t muster the numbers to fight them off. To be sure, it was exciting — at one point, I was beaten down to one province, fought off a siege with my last remaining army, and made a temporary comeback. And having to regularly fight larger, stronger enemies with my one proper army taught me a lot about battle tactics. That was where I refined my basic strategem: line up a spear wall of ashigaru on top of a hill, then aggressively skirmish with archers. Once the enemy archers are driven off the field, then their remaining troops have to either charge uphill into the spear wall, or be gnawed to death by my victorious archers. But despite winning every major battle, I lost the war. In the end, beset from all sides, with an empty treasury and not enough troops, I quit. For this campaign, I did the opposite. 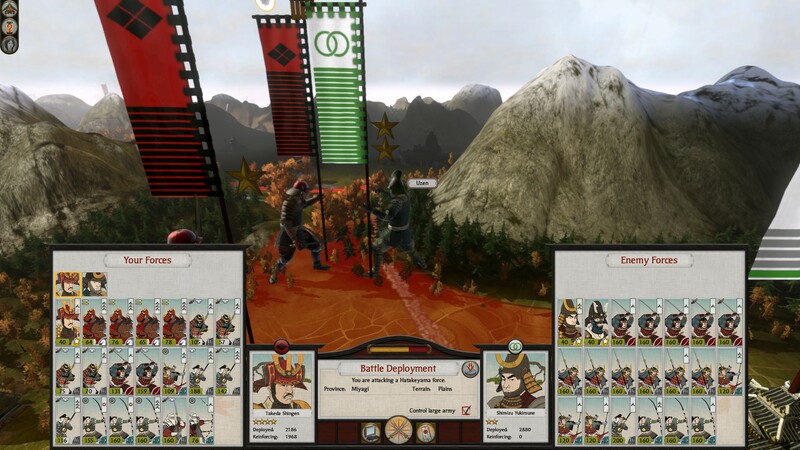 From the start, I focused on my economy; I rushed economic techs, invested heavily in farms and markets, and trained cheap, cheerful ashigaru instead of splurging on samurai. 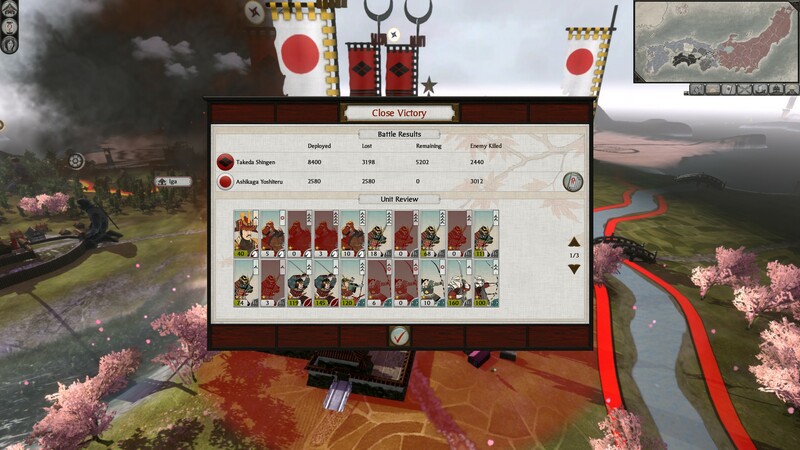 Man for man, my ashigaru couldn’t fight as well as samurai; I overcame this through a combination of numbers and superior defensive terrain (hills, castles, and river crossings). And I was very careful not to push beyond defensible “bottleneck” provinces, such as North Shinano. That paid off spectacularly. By the time realm divide kicked in, I had a treasury of ~75,000 koku; for context, a full stack of samurai costs approximately 13,000-14,000 koku to recruit. It also helped that I was very lucky in how the political situation shook out. My early allies, the Jinbo and the Imagawa, were successful for most of the game, and the Otomo were willing to accept my overtures. That gave me a secure western border until the endgame, and prevented me from having to fight a two-front war. In consequence, after defeating my early enemies — the Satake, Satomi, and Uesugi — I enjoyed a long stretch of peace for much of Part 2. 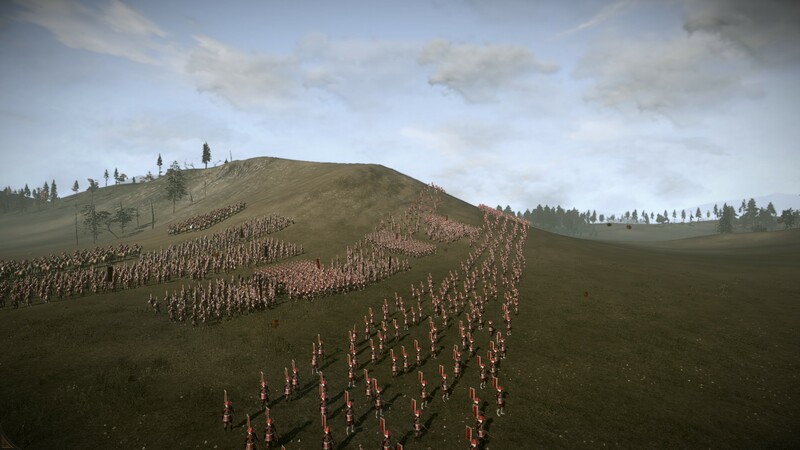 And Total War games aren’t balanced around long stretches of peace. Much of the challenge derives from the need to balance guns and butter; during peacetime, the human player can invest money into economic development, which produces more money, which can reinvested into development, and so on in a virtuous cycle. This produced the easiest Shogun 2 endgame I’ve ever enjoyed. 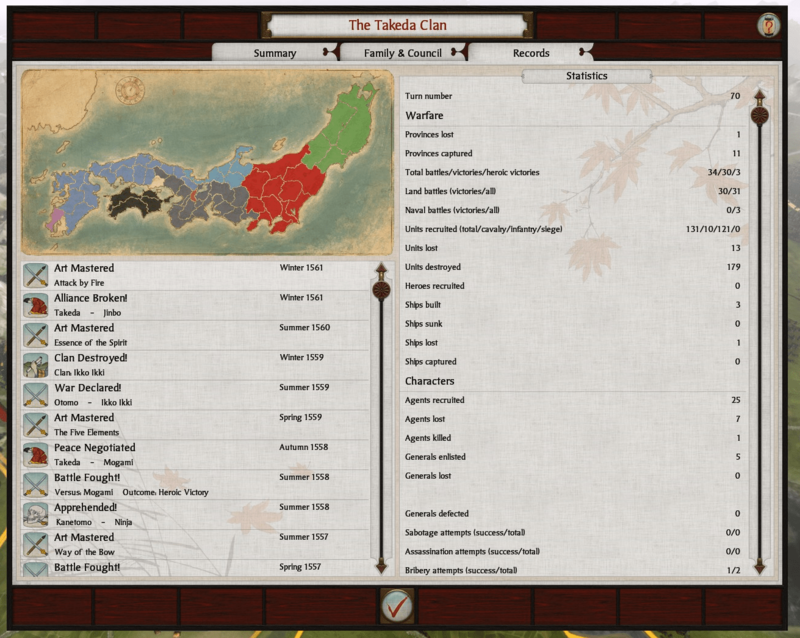 The Otomo and I emerged as hands-down the most powerful clans in Japan, and we crushed our foes between us. Had my western allies been overrun, leaving me with hostile clans on both borders (and this could well have happened – at one point, the Jinbo and Imagawa were down to one province each), I would have had to divert resources to short-term defence instead of my long-term buildup. And had the Jinbo, Imagawa and Otomo leagued together against me instead of fighting amongst themselves, I might not have been able to punch through to Kyoto with the ease that I did. 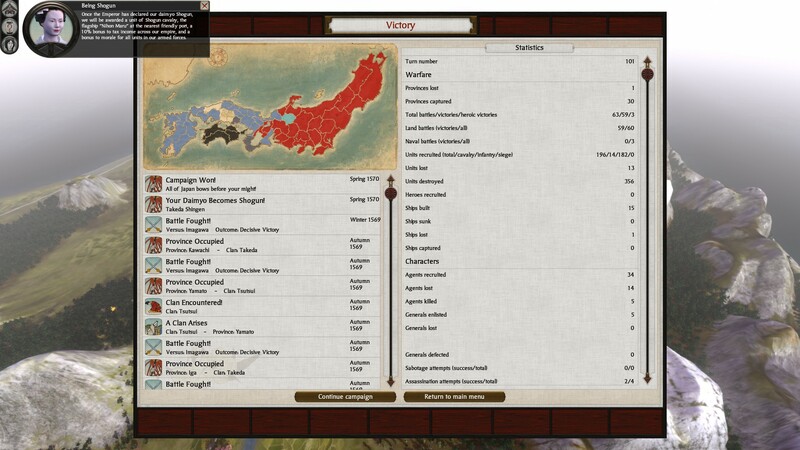 That wraps up my Let’s Play of Shogun 2. Thank you for reading, and I hope to see you around the site.